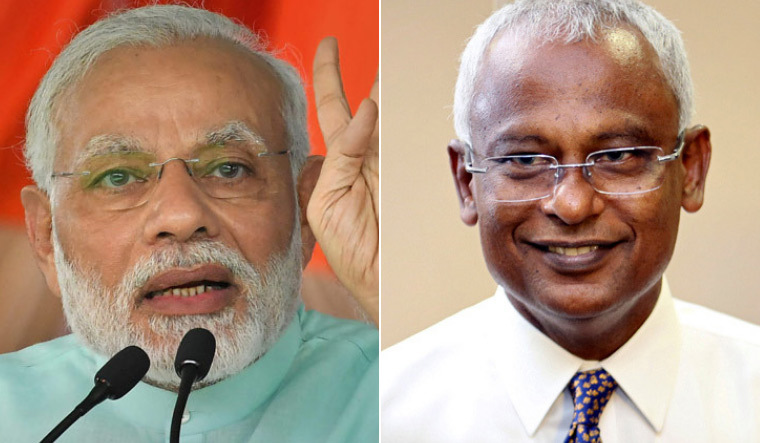 Sending out a huge message on the revival of ties, the ministry of external affairs on Friday said Prime Minister Narendra Modi will attend the swearing-in ceremony of Maldivian president-elect Ibrahim Mohamed Solih on November 17. Solih had won the Maldives presidential elections on the September 23 and Abdulla Yameen was forced to concede defeat. Yameen had agreed to vacate the position on November 17 when his term ends. The relations between India and Maldives were on a downward spiral during Yameen's term, which was nothing short of an autocracy. Yameen had openly embraced China over India. India was even in an embarrassing position of being forced to take back a helicopter it had gifted to Male. However, Solih's win had revived hopes of improving the bilateral relations. Modi attending Solih's swearing-in ceremony can be seen as the first step towards improving relations. Soon after Solih was elected as the president, Mariya Ahmed Didi, spokesperson for the president-elect of Maldives, told THE WEEK that the administration would work on reviving ties. "Throughout our history, we have always maintained a close relationship with India. Given our shared history and cultural bonds, I hope the new administration can quickly work to repair the trust deficit that has damaged relations over the past few years," Didi had said.